When I make Maria Elia’s spiced chicken, I serve it with pita or naan, fresh from a kebab shop if I can, hummus – sometimes homemade, and tabouleh – always home made. I’ve never had good take-away tabouleh and I think it’s because it sits too long in the juices and becomes soggy. I posted this meal as a summer alternative to a roast and it’s become a firm favourite during any season, even with my youngest, fussiest eater. In that post, I promised to share Tess Mallos’ tabouleh recipe with you. It is by far the best recipe I’ve tried and would proudly stand up to any restaurant dish. Tess talks about the quantities of tomato and burghul wheat in her salad, mentioning that different regions and countries use different ratios. The important thing is to make it to your taste, which goes for the amount of lemon juice you use as well. II’ll present the recipe with the proportions you’ll find in most Lebanese restaurants. 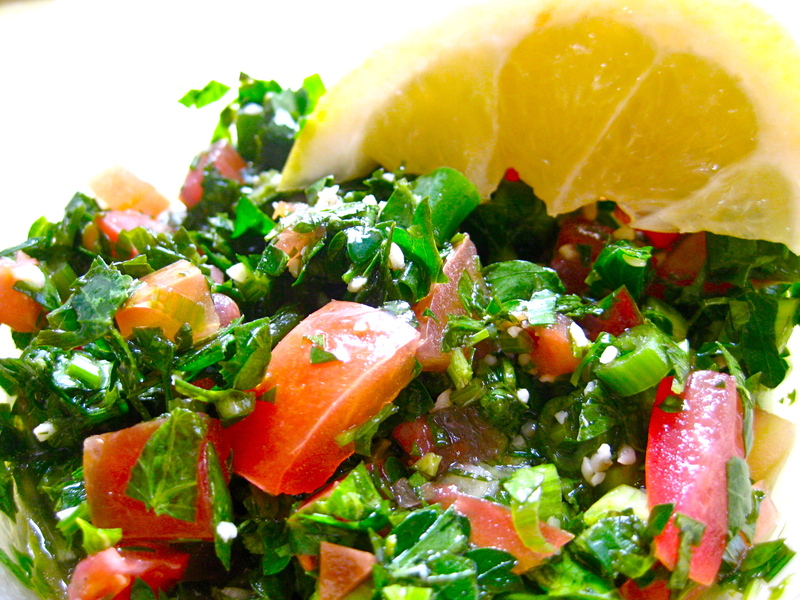 Keep in mind though that once you add the tomato, you must serve as soon as possible as it can make the tabouleh soggy. A post about this classic parsley salad can be found on The Kitchn Blog. They highly recommend Ottolenghi’s suggestion of throwing in a bit of all-spice which in this meal would complement the all-spice-flavoured chicken as well. In bowl or jug, put the burghul wheat and pour water up to half an inch over the burghul. Leave to absorb for an hour. If you have less time, use hot water. Wash the parsley and wrap in a tea-towel. Refrigerate for an hour or so. This step can be skipped, but it makes for lovely crisp leaves. If you’re washing your herbs you must dry them in this recipe or you’ll end up with mush. In a food processor, blitz the spring onions and mint, till finely shredded. Scrape into a bowl. Chop the tomato, removing the seeds and watery bits if possible. Roughly chop and put one bunch of parsley into the processor and blitz only until the leaves are chopped. Too much and it’ll go mushy. Do the same with the next bunch. Don’t be tempted – like I was – to put both bunches in or leave out the ‘rough chop’. The processor simply won’t handle it. Tess says that when the burghul is ready, you should put it in the bowl with the onion and give it a good squeeze – to infuse the onion and burghul flavours. Put the parsley into the bowl and season with lemon juice, olive oil, salt and pepper – and if you’re game – 1/4 tsp of all-spice. Hi Louise, thanks for that, I’d heard curly parsley doesn’t make for a great substitute but it’s good to hear that it will work if flat-leaf isn’t available. Hi Ani, thanks for the tip – what a great idea. For those who want to leave out the grain component altogether (Paleo diet/Crohn’s) just leave out or minimise the bulghur.